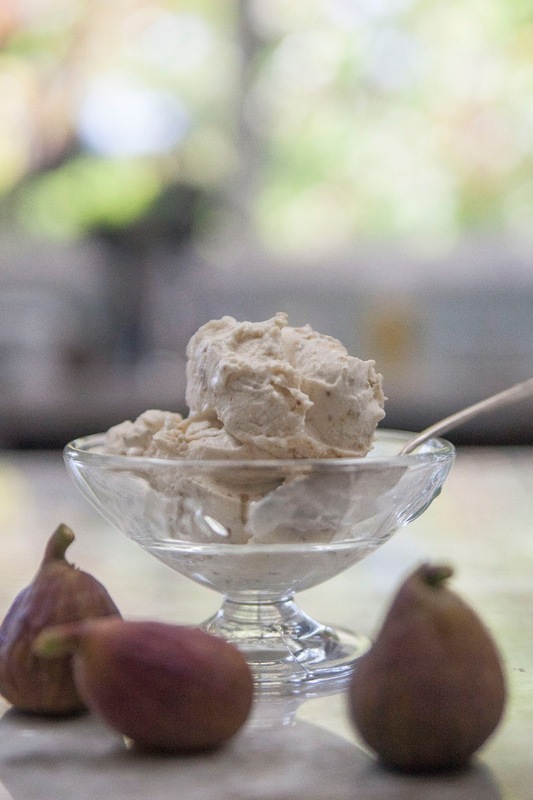 The Colors Of Indian Cooking: It's Fig Season In Sonoma. Time for Fig and Lobster Risottto! It's Fig Season In Sonoma. Time for Fig and Lobster Risottto! 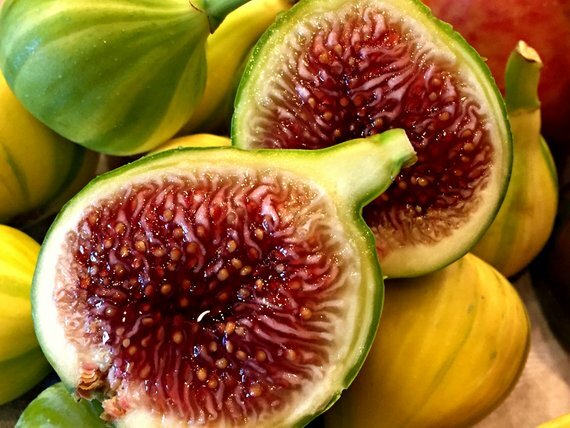 If there is one fruit that stands out among my favorites, cherry, pomegranate, and persimmon, it's figs. I love them. Any variety, any time. One of the first things we did when we put the vegetable garden in at our new house was plant a fig tree. I thought I was buying a Mission fig. Instead our tree is a panache fig. Tiger striped, and incredibly sweet, they are the last figs to ripen in fig season so we're still waiting. However, we have a friend who has a magnificent fig tree but hates figs. Isn't that always the way it is? He's perfectly happy to let me pillage his tree every year around this time. I take away pounds of figs. When I see them at the market for 6.99 for a little basket I laugh because up here in Sonoma figs are like weeds. They grow all along the roadsides and anyone can just help themselves. A few years back a friend and I did the whole gleaning thing and we gathered pounds and pounds and pounds of unwanted figs. I made preserves from mine. If you'd like the recipe it's here...Fig Jam. Or, if you'd like a roasted fig and goat cheese ice cream...I've made that too. The recipe is here.But now I'm interested in something beyond just the figs...I'm into the fig leaves. Yes, fig leaves. Straight up Adam and Eve wardrobe, now I discover it's edible. Who knew? As it turns out fig leaves can be used for a variety of purposes very similar to grape leaves. They can be used as a food wrapping, they can be ground of tea, they can be smoked and used as an ingredient such as these Smoked Fig Leaf Shortbread Cookies. They can also be a simple ingredient in a risotto which is what I'm talking about today. This all came together around a bunch of free figs and a huge lobster tail sale. If lobster is ever on sale anywhere, I'm there! So, if you can get your pie hooks on some cheap lobster, fresh figs, and a few fresh non sprayed fig leaves I've got a recipe for you. Wash, dry, and cut the fresh figs into halves, then quarters . Set aside. Take the meat from the lobster tails and cut it into bite sized pieces. Set aside. Save the shells if you like, they can be used for lobster stock. Slice the sage leaves thinly and set aside. In a large pot for risotto heat the olive oil. When the oil is hot pour the rice into the pot and stir it around to warm it. Now add in the 2 cups of water and 2 tsp of salt. When the water comes to a boil lay the fig leaf on top of the water and rice. When the water starts to boil, put a lid on the pan and turn the heat down to the lowest it will go. Let it cook for 15 minutes. Heat a couple of Tbs of olive oil in a skillet. When the oil is hot add in the thinly sliced shallot. Saute it until the shallot starts to lightly brown. Add in the thinly sliced sage leaves. Saute them for a minute or two. Add in the 1/2 cup of white wine, along with the figs. Saute them for a little bit to soften them letting the wine evaporate. When the figs have cooked add in the pieces of lobster. Stir them around and simmer them gently. The lobster cooks fast so keep an eye on it, you don't want it to toughen. Stir everything together well on a low flame. Right about now the rice should be done. Add 1Tbs of unsalted butter to the fig and lobster mixture. This gives it a nice creamy texture. Take the lid off the pot of risotto. Add the fig, lobster, and sage mixture to the risotto. Stir it all together. Add a few shreds of fresh sage over the top. Voila! You are done! There it is a lovely fall lunch, light and elegant and it only takes 15 minutes to cook!